Writing Passing of the Pioneers is becoming a longer process each month as I get drawn into the stories. I think it all began when I started searching for photos to compliment the obituaries, making the posts more visually appealing. That sometimes takes some extra searching and other information arises that is just too good to let pass. For the January Passing Pioneers, there is Sarah McDonald one of those pioneering women I read about and think “Wow.” Also another member of the Laidlaw family, a Hamilton publican and a man who had the unenviable task of being called as a witness in a Casterton murder case. David Wemyss GALLIE: Died 12 January 1868 at Portland. From the first reading of his obituary, David Gallie was simply the long-time bank manager of The Bank of Australasia in Portland. But digging up a bit more about him unearthed some interesting family links. From the Australian Death Index at Ancestry I discovered David was the son of Hugh and Robina Gallie and was born around 1813. The earliest record I could find of him in Australia was again at Ancestry and the New South Wales, Australia, Returns of the Colony, 1822-1857. David was working as a clerk in the Surveyor General’s office. In 1840, David’s sister, Anna Maria married Edward Henty of Portland at St James Church in Melbourne. “Family Notices.” The Cornwall Chronicle (Launceston, Tas. : 1835 – 1880) 14 Nov 1840: 2. Web. 27 Jan 2015 . David Wemyss Gallie himself married in 1842 to Elizabeth Francis Gordon in Launceston. Elizabeth was the daughter of Captain Donald McArthur. Just for interests sake, I Googled the said Captain and found a great site called the Telford Family of Ellinbank. The site includes the McArthur family and from there I discovered Elizabeth’s mother. Elizabeth Wemyss. That name was familiar. Of course, Wemyss was David Gallie’s middle name. What? Yes, David was related to his new bride. In fact, David and Elizabeth were cousins with their mothers Elizabeth and Robina sisters. At some point, David began working for the Bank of Australasia and in 1846, he and Elizabeth travelled to Portland on the Minverva accompanied by David’s brother-in-law Edward Henty. This was possibly the time David took up his position as the manager of Portland’s Bank of Australasia. 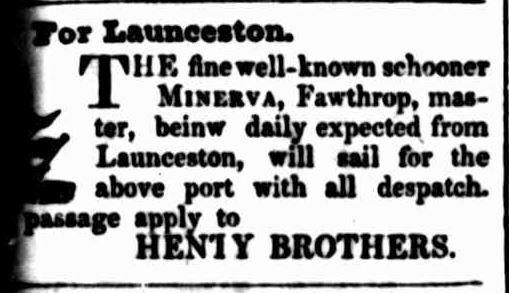 “Shipping Intelligence.” Colonial Times (Hobart, Tas. : 1828 – 1857) 2 Jun 1846: 2. Web. 27 Jan 2015 . The Minerva was owned by the Henty Brothers and Captain Fawthrop her master. The Henty’s used the schooner to transport goods and sheep between the two colonies. “Advertising.” Portland Guardian and Normanby General Advertiser (Vic. : 1842 – 1876) 24 Sep 1842: 1. Web. 5 Feb 2015 . The funeral of David Gallie was well attended with “most of the principal gentlemen of the town and district” there to pay their respects. They included brother-in-law Edward Henty and his brother Stephen Henty. “Family Notices.” Portland Guardian and Normanby General Advertiser (Vic. : 1842 – 1876) 30 Jan 1868: 6 Edition: EVENINGS. Web. 24 Jan 2015 . William FOSTER: Died 12 January 1896 at Branxholme. William Foster was not as old as the usual pioneers listed here, but his sudden death at thirty-three years of age made headlines around the country. On Sunday 12 January 1896 William, a carpenter by trade, attended his local Church of England along with his wife and elderly parents. During a hymn, William appeared to have fainted, but upon removing him from the church he died. George BAXTER: Died 8 January 1900 at Hamilton. George Baxter has links to two different branches of my family tree. The first was his role as a witness in the murder of the Hunts of Casterton in 1860. My ggg grandmother Mrs Margaret Diwell was also a witness in the trial. George’s second link was via the Holmes family. His daughter, Elizabeth Jane married William Tyers Holmes a brother of George Holmes, husband of my ggg aunt Julia Harman. 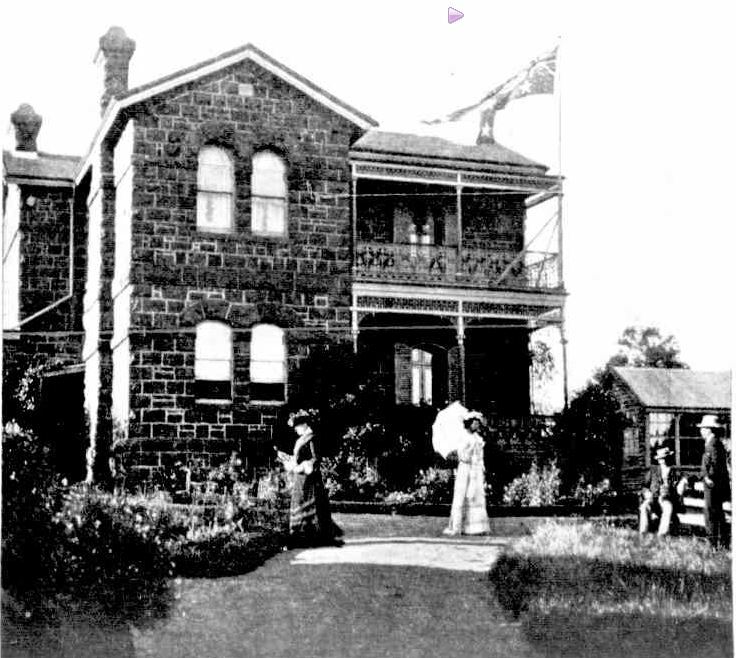 Julia and Elizabeth both signed the Victorian Women’s Suffrage Petition at Casterton in 1891. For more information on George’s and his family, see the SW Pioneers site. Adam TURNBULL: Died January 1905 at Coleraine. Adam Turnbull’s parents, Dr Adam Turnbull and Margaret Young travelled to Tasmania from Scotland in 1825 and Adam junior was born around 1827. 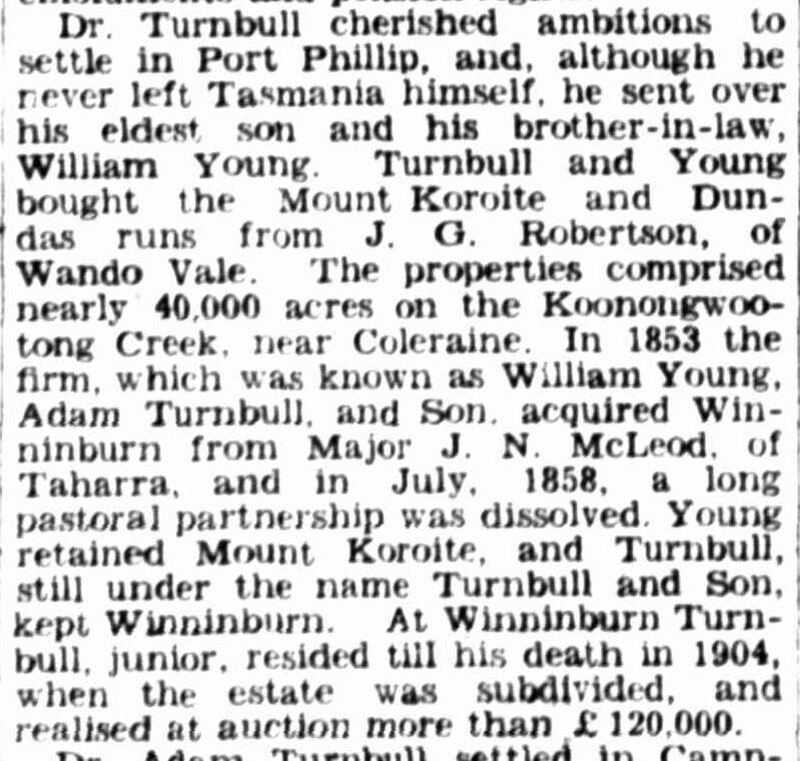 In 1845, Adam’s father sent him to Victoria to oversee the purchase of the Mt Koroite and Dundas runs. Who accompanied him on that trip varies between the article below and Adam’s obituary but it was either William Young, Adam’s uncle or another member of the Young family, George. “PASTORAL PIONEERS.” The Australasian (Melbourne, Vic. : 1864 – 1946) 17 Aug 1935: 4. Web. 25 Jan 2015 <http://nla.gov.au/nla.news-article141761090&gt;. The company of Turnbull and Son’s also purchased the Winninburn run where Adam died in 1905. During his time in the district, Adam Turnbull jnr was the first president of the Shire of Wannon and was on the first committee of the St Andrew’s Presbyterian Church at Coleraine. His grandson, Sir Winton George Turnbull of the Country Party, was a member of the House of Representatives as the Federal member for the Wimmera. Edward WHITE: Died 20 January 1910 at Coleraine. Edward was born around 1837 and arrived in South Australia from Ireland around 1851. In the early 1860s, he moved to Victoria when the family took up the Den Hills run near Coleraine. Edward served on the roads board and was a worthy athlete during his younger years. His wife predeceased him and they had one son. There is more information about the White family on the SW Pioneers site. Thomas LAIDLAW: Died 12 January 1915 at Macarthur. Thomas Laidlaw was born in Scotland in 1833 and arrived with his brother Robert to Victoria around 1851. He headed to Newlands Station near Harrow to work with his brother Walter Laidlaw, a Passing of the Pioneers subject last month. A description of Thomas’ arrival was in his obituary and that of this son Thomas Haliburton Laidlaw, a Passing Pioneer in September 2011. “THE LATE MR. T. H. LAIDLAW.” Portland Guardian (Vic. : 1876 – 1953) 25 Sep 1941: 2 Edition: EVENING. Web. 5 Feb 2015 . In 1857, Thomas married Grace McLeod of Wallan however Grace passed away in 1864 but not before five sons were born, including Thomas Haliburton. In 1868, Thomas married Christina Linton and they had a son and a daughter. Thomas moved to South Australia to farm with his brother Robert before moving to Dunkeld and then Glenburnie at Macarthur. He then purchased South Wonwondah south of Horsham, living there for eighteen years before moving closer to Hamilton, residing at Glencairn. Daniel Michael SCULLION: – Died 27 January 1915 at Hamilton. Daniel Scullion was born at Garvoc in 1868 to John Scullion and Janet McKeller. He appears to have ventured into the hotel business in his hometown as licensee of the Yallock Inn which he still owned at the time of his death. By then, Daniel had been in Hamilton around ten years, first operating the Hamilton Inn and then the Caledonian Hotel that still exists today. In 1909, Daniel moved to Horsham and took on the license of the Wimmera Hotel. Within a couple of years, he had returned to Hamilton, resuming as licensee at the Caledonian Hotel. “HAMILTON.” The Australasian (Melbourne, Vic. : 1864 – 1946) 2 May 1903: 27. Web. 25 Jan 2015 . Daniel was a keen supporter of sport in Hamilton particularly the North Hamilton Football Club and donated many trophies to the club. Margaret MEAGHER: Died January 1918 at Port Fairy. A colonist of fifty-eight years, Margaret Meagher arrived in Melbourne with her husband James Prior in 1859 aboard the Sarah Dixon. Originally from Tipperary, Ireland, the Priors moved to Port Fairy the following year and remained there until their deaths. James died around 1911 and when she died, Margaret had two sons and three daughters remaining. Margaret was buried at the Port Fairy cemetery. John COGHLAN: Died 8 January 1918 at Garvoc. John Coghlan was an early native of the Colony of Victoria, born at Eastern Hill, Melbourne around 1841. His father, William Coghlan was a landholder in Melbourne but sold his properties and moved to the Western District, taking up land at Port Fairy. The family next moved to Warrnambool, living at a property on the Merri River, and John’s father continued to farm. After his marriage to Miss Patton, John and his wife moved to Cooramook near Grassmere and then later on to Garvoc around 1878, purchasing the property Pine Hills where he engaged in dairy farming. According to the obituary, John did not live as long as his parents. His father William lived to ninety-seven while his mother apparently lived to 107. John was buried at the Terang Cemetery. 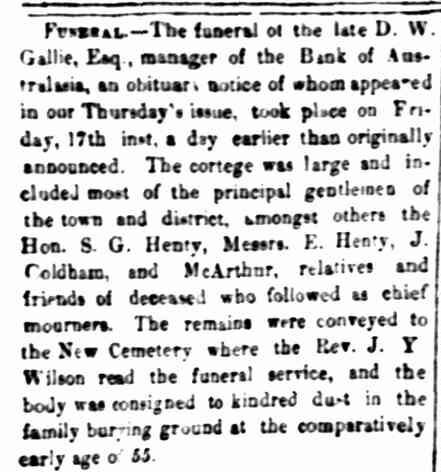 “BREVITIES.” Clarence and Richmond Examiner (Grafton, NSW : 1889 – 1915) 5 Nov 1907: . John PETTINGILL: Died 23 January 1923 at Yambuk. John Pettingill was born in Suffolk, England around 1843. When he was nine, he travelled with his parents to Portland aboard the Eliza. John’s father first worked at Castlemaddie Station at Narrawong owned by Andrew Suter. Mr Suter moved to Yambuk Station and the Pettingill family went along. When nearby St. Helens was surveyed around 1863, John and his father purchased 200 acres. John remained on that farm for the rest of his life. Around 1870, John married a Port Fairy girl, Miss Bowyer who was still living at the time of John’s death along with five sons and four daughters. 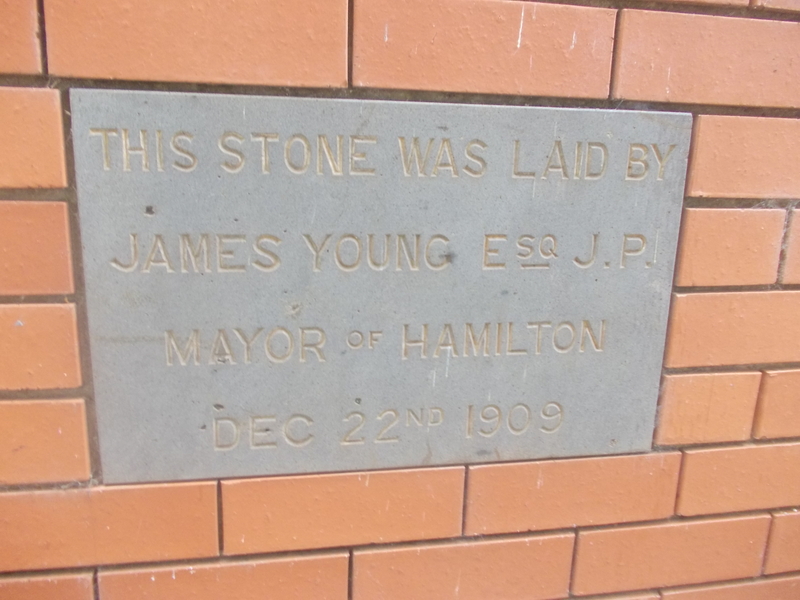 James YOUNG: Died 6 January 1925 at Hamilton. James Young was born around 1851 in Scotland and arrived in Victoria as an infant. 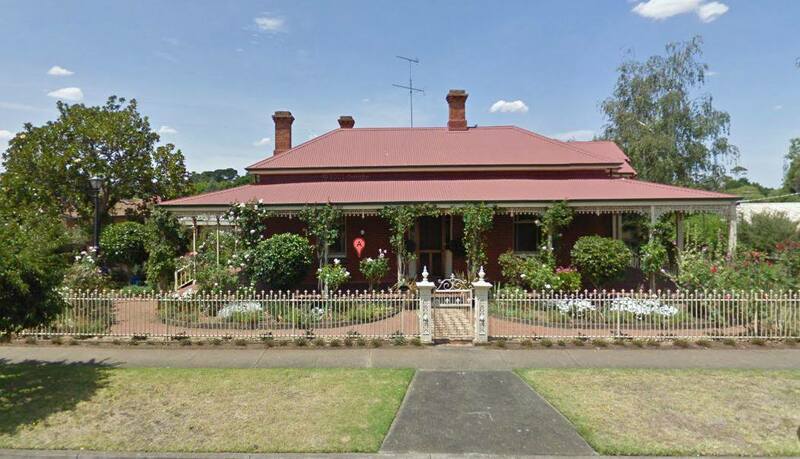 The Young family settled in Ballarat and James attended school there before farming at Tatyoon, west of Ballarat. 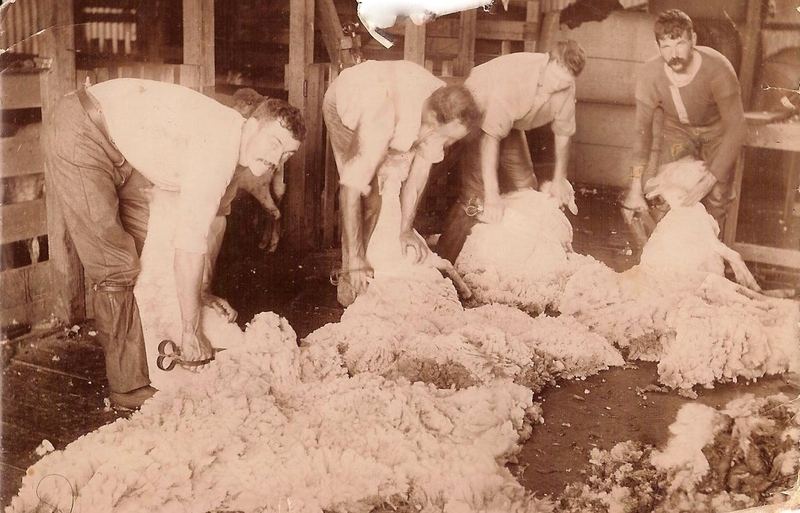 He then joined his brothers in the Wimmera to work with them in their stock and station business. When a branch opened in Hamilton in 1888, James moved south to manage affairs. A successful businessman, James soon built up the trade, also moving into public office as a town councillor for a several years. 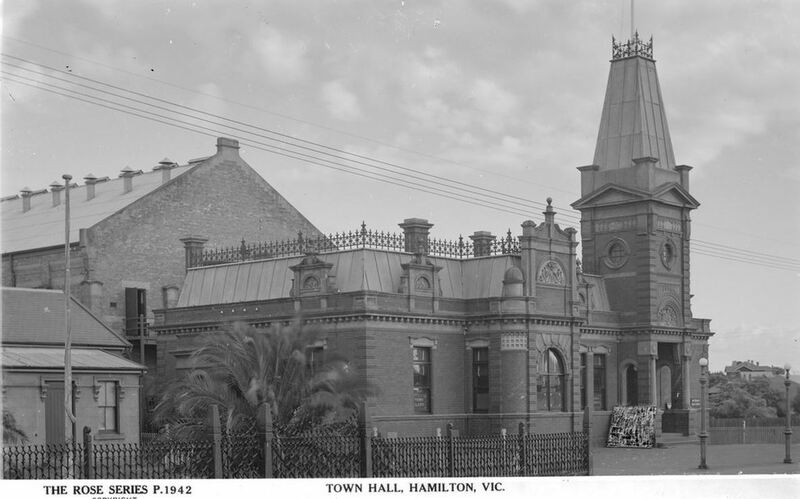 In 1909, he served as Mayor and laid the foundation stone for Hamilton’s new Town Hall in Brown Street (below). Unfortunately, the front section of the Town Hall was demolished in the 1960s and a “modern” façade added. James Young passed away at his home Ivanhoe in Chaucer Street, Hamilton. Sarah McDONALD: Died 25 January 1941 at Hamilton. Born about 1855 in Inverness, Scotland, Sarah McDonald was a true pioneering woman. She travelled to Tasmania as a child in 1857 with her family aboard the Persia. 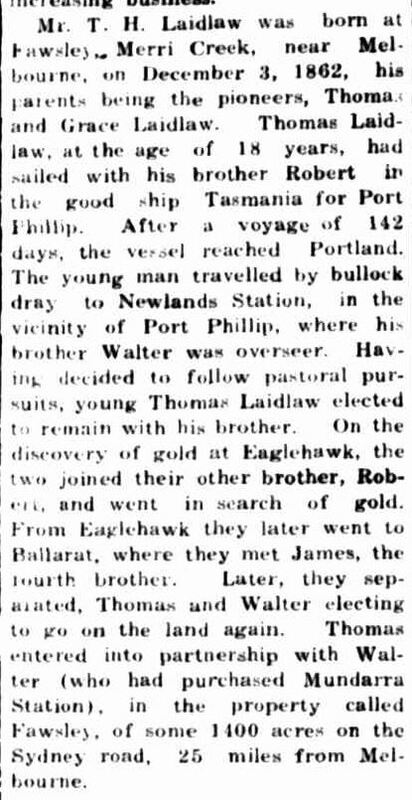 Unfortunately, her father and brother died during the voyage but after a short break in Tasmania, the family continued on to Portland. Around 1877, while still a single woman, Sarah rode from Branxholme to Horsham, with an overnight stop, to buy 320 acres at Scotchman’s Creek (Telangatuk) at the land sales. It was in that district Sarah met Lachlan Cameron and they married in 1876. Lachlan passed away in 1901 and Sarah stayed on the farm for a further twelve years before moving to Hamilton. This entry was posted in Pioneer Obituaries and tagged Baxter, Coghlan, Foster, Gallie, Laidlaw, McDonald, Meagher, Pettingill, Prior, Scullion, Turnbull, White, Young. Bookmark the permalink. Hi, i am trying to find information about my great grandmother. Her maiden name was Florence McDonald. She married an Alexander G Brander. While living in Donald, they had a daughter Florence Jean (Joan? On some paperwork), and from the birth register which is VERY hard to read, it states she was born at “Ivanhoe” , Donald shire, county of Kara Kara on 21 March, 1921. I am hoping that maybe someone can help with some further information?. Maybe HER parents names, anything really. We seem to have come to a stop, and cannot go further. Thanks in advance for any small amount of information.